So far we have discussed the original “The Jazz Singer” (1927) with Al Jolson; as well as the very fine remake, “The Jazz Singer” (1952) with Danny Thomas. However, there is one more version left to discuss, a version that would be rather forgettable if it were not for the fact that scenes of it were filmed in the sanctuary of the Breed Street Shul, in Boyle Heights. In 1980 there would be a second big-screen remake of The Jazz Singer, this time casting Neil Diamond in the lead role of the cantor’s son and the father played by Laurence Olivier. The film which got off to a rocky start due to studios and actors bailing on this project early on, though when the female lead dropped out of the film they re-cast the part with Lucie Arnaz, the spunky actor-singer daughter of Lucille Ball and Desi Arnaz. This was supposed to be a first glorious on-screen break in a feature film role for singer Neil Diamond. Though this proved to be a role in which he would fall flat. “The Jazz Singer” has so many things wrong with it that a review threatens to become a list. Let me start with the most obvious: This movie is about a man who is at least 20 years too old for such things to be happening to him. “The Jazz Singer” looks ridiculous giving us Neil Diamond going through an adolescent crisis. The movie is a remake, of course, of Al Jolson’s 1927 “The Jazz Singer,” which was the first commercially successful talking picture. The remake has played with time in an interesting way: It sets the story in the present, but it places the characters in some kind of time warp. Their behavior seems decades out of date, and some scenes are totally inexplicable in any context. For example: In the film, Diamond plays a young Jewish cantor at his father’s synagogue. He is married, he has apparently settled down to a lifetime of religion. But he also writes songs for a black group-and when one of the quartet gets sick, Diamond takes his place, appearing in a black nightclub in blackface. Oh yeah? This scene is probably supposed to be homage to Jolson’s blackface performance of “Mammy” in the original, but what it does in 1980 is get the movie off to an unintentionally hilarious start. The bulk of the movie concerns Diamond’s decision to leave New York, his father and his wife and go to Los Angeles, where he hopes to break into the music industry. This whole business of leaving the nest, of breaking the ties with his father, seems so strange in a middle-aged character: Diamond is just too old to play these scenes. But no matter; the movie is ridiculous for lots of other reasons. But then Diamond’s whole presence in this movie is offensively narcissistic. His songs, are melodramatic, interchangeable, self-aggrandizing groans and anguished shouts, backed protectively by expensive and cloying instrumentation. His dramatic presence also looks over-protected, as if nobody was willing to risk offending him by asking him to seem involved, caring and engaged. Diamond plays the whole movie looking at people’s third shirt buttons, as if he can’t be bothered to meet their eyes and relate with them. It’s strange about the Diamond performance: It’s not just that he can’t act. It’s that he sends out creepy vibes. He seems self-absorbed, closed off, grandiose, out of touch with his immediate surroundings. As harsh as his criticism is, I have to agree; this is probably the most tragic productions and performances I have ever seen on film. This performance would earn Neil Diamond a Razzie for the worst performance in a feature film; and remains marked as one of their 10 worst films of all time. I’m told by my film director buddy David Herrera that the Neil Diamond version of this film quickly became film school comedy fodder. And a subject of ridicule for his use of modern-day blackface and that fight scene that this act ensues in the film. Herrera claiming that next to “Mommy Dearest,” it is one of the funniest unintentional comedies ever made. The film and the acting are just that bad. In the opinion of many film makers, The Jazz Singer is considered the holy grail of Jewish entertainment history, a film with a yichus (legacy); which Neil Diamond royally screwed-up in. Though this film, in my opinion, was made even worse by the fact that Neil Diamond’s attempt at cantoral musical performance is absolutely terrible and irredeemable. The film features only about 30 seconds of a recitation of Adon Olam, which is rushed to completion by the character of the impetuous son; and about a minute-and-a-half performance of a rather soulless version of Kol Nidrei. However, it was not for lack effort on behalf of the producers to make a first-class film. Neil Diamond did actually train with a well-respected Los Angeles cantor in order to prepare for the part. He was coached for the part by one of the greatest cantors in the country, Cantor Uri Frenkel of Temple Ner Maarav in Encino; who also appears in the film, and who was a personal friend of Neil Diamond. And for the most important musical score of the movie, the Kol Nidrei scene at the end, they had also hired the best backing vocals. The men’s choir seen and heard from the bimah, they were professional choral singers from the impressive choirs of congregations such as Sinai Temple and Temple Beth Am. Now with the critical analysis behind us, let me state that visually there is something which does make this film a historical treasure, especially for Boyle Heights history enthusiasts. Though in the 1980 Neil Diamond remake of The Jazz Singer the family again lives in a Jewish neighborhood in New York City just as the original film had, the synagogue scenes were likewise filmed in Los Angeles. Now in order to evoke this sense of a young man returning to the heimish Jewish community of his family and youth, the producers chose to film the synagogue interior shots in the most old-school orthodox Jewish synagogue in Los Angeles; Congregation Talmud Torah – The Breed Street Shul in Boyle Heights, East Los Angeles. In the Kol Nidrei scene, it opens up with the camera focused on the lights of the shul’s seven branched menorah and then zooms outward to reveal a filled sanctuary. The entire floor level filled with men, the women are filling the balcony; according to the orthodox tradition. It is rather impressive to see this grant sanctuary dressed for the High Holy Days and filled to the ceiling. And being that Orthodox Jewish congregations never film during Shabbat or Holy Days, in this film production we probably get the only good look of what a service inside the Breed Street Shul would have actually looked like. When this film was released in 1980 the Jewish community had already migrated away over a quarter-of-a-century before, however, a small group of worshipers still returned regularly for services in the sanctuary; especially on days when a minyan was needed for Torah services, and on High Holy Days. However, just a few years after this movie was made the synagogue building would be damaged and abandoned. On October 1st, 1987, the Breed Street Shul was damaged by the Whittier Narrows Earthquake, the magnitude 5.9 earthquake compromised the structural integrity of the non-reinforced brick building. The grand sanctuary was damaged and subsequently red-tagged, just two days before Yom Kippur. This tragic event would make the film footage from the sanctuary in the 1980 version all the more valuable, and even more memorable than the rather forgettable production it is taken-from. The first remake, The Jazz Singer (1952) was remade starring Danny Thomas as the jazz singing son, and the Eduard Franz as the pious cantor father. This production of the film also produced by Warner Bros. would closely follow the Al Jolson version. Danny Thomas playing a young Korean War veteran who is lunging for success in Hollywood. He returns to his synagogue in the end, where he sneaks into the synagogue’s choir section to surprise his family with his joining in the singing of Kol Nidrei. The musical performance by Danny Thomas is outstanding. And truly impressive, when one considers that he wasn’t Jewish; Danny Thomas was a Lebanese Maronite Catholic. Now what is interesting to take notice of is that this 1952 version of the film was filmed at one of the most fashionable Jewish congregations at the time. It was filmed at Sinai Temple in Los Angeles, in their grand sanctuary of their second synagogue site located near Fourth and New Hampshire in the mid-Wilshire District, which as built in 1925; it was their synagogue site before their eventual migration more westward down Wilshire Blvd in later years. Like other film versions of this story, this 1952 version was also filmed entirely in Los Angeles. It is this time depicted as a congregation Sinai Temple in Philadelphia. Again, having Los Angeles sites being staged as east coast Jewish communities. Today the grand Moorish-Byzantine synagogue building shown in this film is the location of a Korean church, occupying a building which retains much of its Jewish character. Yet the building has seem some changes over the years as the church has made it their own. So it’s really thrilling to in this version of the film see this fine synagogue in its prime, captured through the fine lenses of a major Hollywood film production. In this 1952 production of The Jazz Singer, Danny Thomas does an outstanding job; in this film he ends up delivering one of the best cantoral presentations to ever grace a Hollywood film. Danny had trained for this role under the tutelage of notable cantors; he was vocally coached for this part by Cantor Carl Urstein who was the musical director at Sinai Temple in Los Angeles and Cantor Moe Silverman of Anshe Emet Synagogue in Chicago. Danny Thomas is said to have sang cantonal music in other productions as well, at one time making a lasting impression with his rendition of Rabbi Israel Goldfarb’s famous melody for Shalom Aleichem. He had also previously played a leading role as a cantor in the movie “Big City” in 1948. He was so good at playing the part, a lot of people going forward just assumed he was Jewish. Sinai Temple: Their second location, at Fourth and New Hampshire, built in 1925. Today the site is a Korean church. The entrance to Sinai Temple. Notice how much the inside looks like the inside of the first Sinai Temple, which is today’s Pico-Union Project. Eduard Franz playing the cantor; with the musical voice-over by Cantor Saul Silverman of Temple Israel of Hollywood. Danny Thomas singing in “The Jazz Singer” (1952); which was filmed at the old Sinai Temple, at Fourth and New Hampshire. Danny Thomas did a wonderful job, even though he wasn’t Jewish at all; he was a Lebanese Marionite Catholic, who many people assumed was Jewish. Now even for to the untrained ear, the singing parts of the cantor father are remarkable and stand apart as phenomenal. Though Eduardo Franz played the father on-screen, the singing heard in the film was actually a musical voice-over performed by the very talented Cantor Saul Silverman of Temple Israel of Hollywood. Jerry Lewis – The Jazz Singer (1959); made for television production. This second version of the Jazz Singer in 1952 would be adapted into a taped television version for Ford sponsored show Startime and broadcast on NBC on October 13, 1959. In this version Eduard Franz would reprise his role as the Cantor Rabinowitz, and this time playing the role of a son who was only interested in singing jazz music and making comedy, played by the comedian Jerry Lewis (born Joseph Levitch). In which the movie ends with Jerry Lewis singing Kol Nidrei in clown-face make-up. I n the cannon of Hollywood Jewish films, “The Jazz Singer” is among the most beloved and celebrated. And now that we are in the Jewish High Holy Day season, having just celebrated the Jewish near called Rosh HaShanah and preparing for the day of atonement called Yom Kippur. And during these ten Days of Awe this film title has become one of the seasonal staples for Jewish fans of classic films, and it certain is one of my favorites as well. Now because the film is so loved, everyone in Los Angeles seems to have a colorful story about it. There are even several different synagogues in the shadow of Hollywood which proudly claim to have been the location where this legendary movie was filmed. So the big question I often get when standing in front of various old synagogue buildings across the city of Los Angeles is this: Wasn’t “The Jazz Singer” filmed here? The question I sometime have to ask back is this: Which of the films are we talking about? Some of the claims local shuls have about being connected to this movie are bubbe-meises. Though not all these claims should be so quickly dismissed. There are three film productions, which would bear the title of this most famous of Jewish American stories. In these various productions we do get a few interesting peeks at some of the most lovely old Jewish sites in the city of Los Angeles. In this three-party series we will virtually explore these together. And along the way learn a bit about the history of this all-American Jewish favorite holiday film. 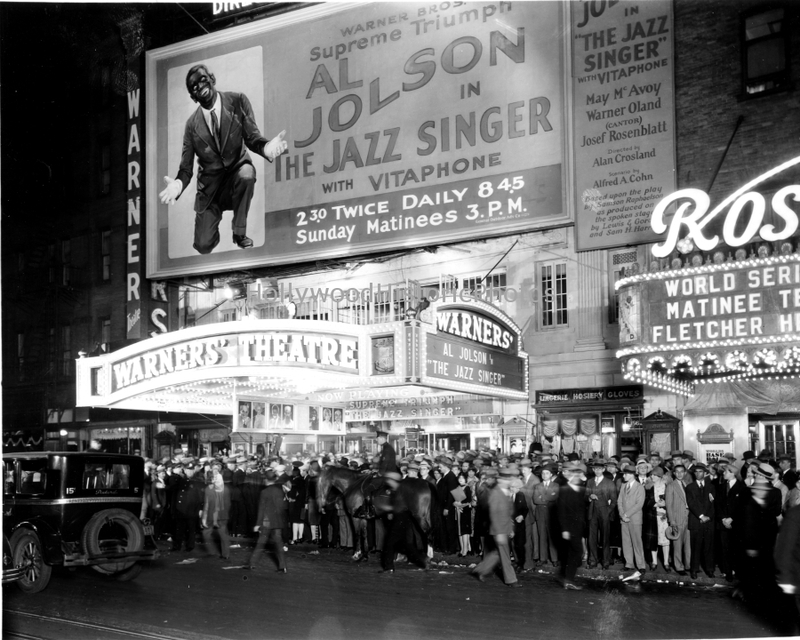 In 1927 the ground-breaking film production of “The Jazz Singer” staring Al Jolson would make history as being the first talking-film with synchronized music on Vitaphone sound-on-disc; this is regarded as having brought an end to the silent film era. In the story Cantor Rabinowitz wants his son Jackie to follow in the family traditions of becoming a hazzan – a musical leader of the ancient liturgical Hebrew prayers, at the synagogue in his New York’s Jewish ghetto of the Lower East Side. The conflict of our film presents itself right away when the father is alerted by a local and finds his son in a beer garden singing jazz tunes. The father confront his son for debasing his G-d given voice with such music, and decides to teach him a lesson with a whipping. That day the son makes a vow to his father as he clings to his mother for protection: “If you whip me again, I’ll run away—and never come back!” After taking his beating, the son then kisses his mother and leaves home, only returning while the family is away Yom Kippur services to grab a picture of his dear mother. That night the cantor also makes a vow in his heart and says to his friend at Kol Nidrei, “My son was to stand at my side and sing tonight – but now I have no son.” The cantor vows in his heart that his son is now dead to him. The story is of a prodigal son of the Jewish American experience. Then after a decade has passed and going by the assimilated name of Jackie Robins, he is finally given a big-break. Jackie would be offered the promise of success as a singer when after catching the attention of the musical theater crowd, and is then offered the lead role in a new musical. However, a couple of weeks after their fight the cantor would then fall seriously ill, just the day before Yom Kippur. And for the first time the Jewish congregation is left without anyone to lead the services for the Day of Atonement. And so they appeal to the young Jackie, whose father has been dreaming of his son singing Kol Nidrei in his place, musing that surely if Jackie would do this one thing he would surely be forgiven. However, filling in for his father on Yom Kippur would mean Jackie sacrificing the opening night of his new Broadway musical, a move which he is told would end his entire entertainment career. He is advised that if he is a no-show, he will never work on Broadway ever again. Jackie is then forced to choose between his Jewish identity and his career. In the end, young Jackie would cancel the show opening. And he would return back to the synagogue of his family and of his youth, and would sing the grand liturgical opus of Kol Nidrei; written in Aramaic and ordered according the solemn procedures of Jewish law, it is said for the annulment of all vows in preparation for the day of atonement and forgiveness. Jackie ascends to the bimah and sings these profound melodies for the congregation as cantor, in his father’s place. The yiddish prodigal son had returned, their bad vows are annulled and forgiveness is found. The film concludes with the young man seemingly blessed with parnasa; as he ends up finding career success as an entertainer. It is one of the best stories ever told. But where did the inspiration for this movie come from? The play would be written in 1922, and first performed on stage at the Warner Theater in NYC in 1925. Due to the great success of the stage play, in 1927 it was announced that Warner Bros. was going to produce a film version of the story starting in June; with the filming with the actors beginning in the month of July. In the month of August the Vitaphone sound sequences were completed. And then on September 23rd it was announced that the film was completed. The film was then released on October 6, 1927 at the flagship Warner Bros. Theater in New York City, the opening was planned to coincide with Yom Kippur, which the plot of this story largely revolves around. It is this Yom Kippur – Kol Nidei theme which has made this a seasonal favorite during the High Holy Days. Now it should be noted that Al Jolson was actually trained and coached in the Jewish cantoral musical style by none less than the great Cantor Yossele Rosenblatt himself, considered the greatest Jewish liturgical voice of all time. 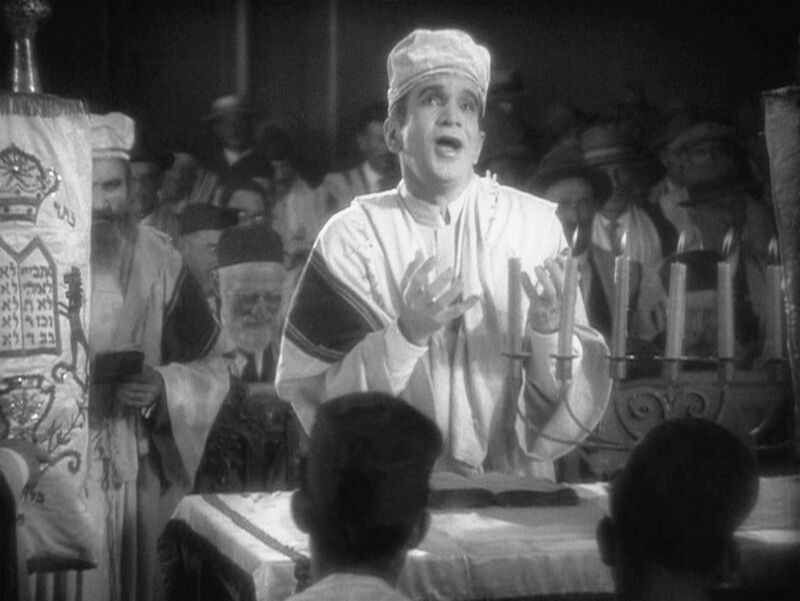 Cantor Rosenblatt was offered $100,000 by Warner Bros. to play the part of Jolson’s cantor father; a part which he turned down, because he felt that Kol Kidrei was too sacred for him to sing in this film. Instead Cantor Rosenblatt takes a smaller roll in the film, in which he plays himself singing liturgical songs in a theater, which melts the heart of the strayed son and reminds him of his cantor father; all of this moving the narrative towards demanding a reconciliation. 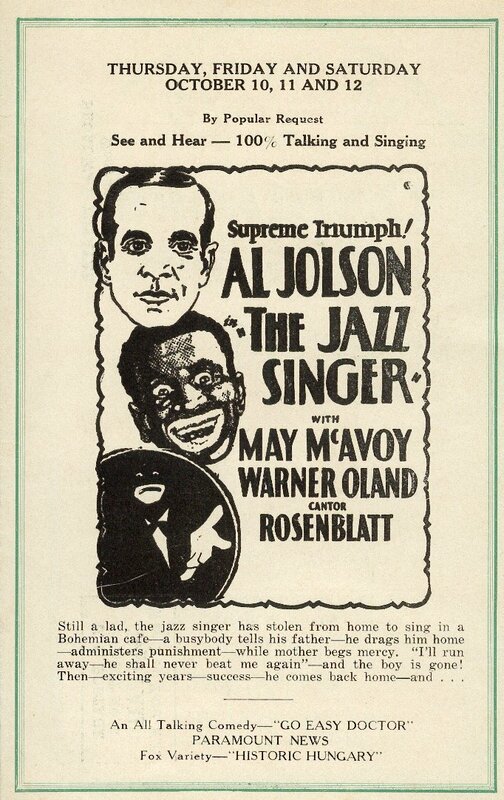 Again it is important to note that Jolson was coached for this part by Cantor Rosenblatt himself. However, the story is told among professional cantors to this day that Al Jolson was actually a really difficult student to try to instruct; as Jolson just wanted to do it all his own way. And it is said that as a result the cantoral pieces Jolson had recorded were actually rather dismal performances. And so when the movie was finally cut, it was said to have only presented the most essential and best pieces of the liturgical songs they had captured. Still I think his singing is all together lovely. Now it must be noted that even though the story is written from an east coast perspective – having scenes depicting places in New York and in Chicago – the movie was very much filmed in Los Angeles. Interestingly, one of the first rumors I ever heard surround the film The Jazz Singer (1927) is that the movie was often said to have been filmed at the Breed Street Shul in Boyle Heights, East Los Angeles. Even though this rumor is false, begin that the Breed Street Shul was the largest Jewish congregation west of Chicago, it is understandable why people would assume that the producers would have automatically chosen that famous site. However, the synagogue scenes for this production were actually filmed on a Warner Bros. Studios sound stage off Sunset Blvd., today the location of KTLA Television in Hollywood. 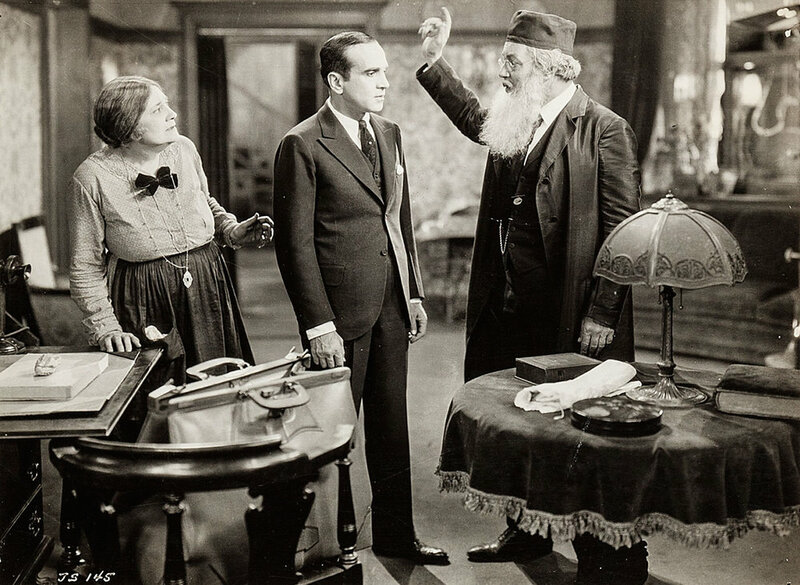 Nonetheless the often repeated claim of being the location where the famed The Jazz Singer (1927) was filmed is also retold by members of several other Los Angeles synagogues. Some of these claims are just assumptions and mistaken leads. While other claims are actually correct about a version of The Jazz Singer being filmed at their site, however they are often just mistaken about the version. Due to the success of this film it would be remade several times over the years. And a latter version of this movie would indeed be filmed in Boyle Heights. This is a topic we will further explore in this three-part series. The Warner Bros. and their Sunset Blvd. Studios, late 1920’s. REMEMBERING SAM WARNER: Samuel Louis “Sam” Warner (born Szmuel Wonsal, August 10, 1887 – October 5, 1927) was an American film producer who was the co-founder and chief executive officer of Warner Bros. Studios. He established the studio along with his brothers Harry, Albert, and Jack L. Warner. Sam Warner is credited with procuring the Vitaphone technology that enabled Warner Bros. to produce the film industry’s first feature-length talking picture, “The Jazz Singer” staring Al Jolson. This movie was a technical and financial challenge for Warner Bros. With a total price tag of $422,000 it was one of the most expensive films in the studio’s history, nearly bankrupting the Warners. It was reported that one of the brothers hocked his wife’s jewels to cover production costs. They really needed this film to succeed in order to save the studio. “The Jazz Singer” ending up breaking box-office records, establishing Warner Bros. as a major player in Hollywood, and single-handedly launched the talkie revolution which ended the silent film era. The world premier for “The Jazz Singer” was set to coincide with Yom Kippur, on account of the Kol Nidrei theme which runs through the film. However, Sam and his brothers would not attend the world premiere of this most famous film, which was set to open in their flagship theater in New York City. Sam Warner died of pneumonia at the age of 40 years old, just the day before the film’s enormously successful premiere; so they left New York to return to Los Angeles to bury their brother in the family tomb at Home of Peace Memorial Cemetery in East Los Angeles. Today is his yahrtzeit, the anniversary of his passing according to the Hebrew calendar. Shmuel Gonzales the Barrio Boychik, saying the Hebrew blessings and lighting the Chanukah lights in Hollywood with the hosts of “Two Jews Talking” Podcast. This year I had the great pleasure of joining my dear friends Josh Heller and Erika Brooks Adickman of the fantastic “Two Jews Talking” podcast to help them light-up the holiday of Chanukah. I’ve had the honor of being on their show a couple times previously, so I was totally thrilled to be asked to come back to celebrate the holidays with them. We came together on the eighth and final night of Chunukah at Tabula Rasa Bar in East Hollywood to kindle the fullness of the Chanukah lights and spread light across city. This event was part of Infinite Light, a city-wide festival powered by Nu Roots – “a movement of young people building community across L.A.” which is funded by generous grants from the Jewish Federation of Greater Los Angeles. Now Josh knows what my interests are, so he asked for historical stories about Chanukah in the early 20th century which shed light on the history of Jews in Hollywood… and maybe even throw in some stories about labor movement or antifascist organizing. Something to inspire us in this dark time of political resistance. Now this was a tall order… one that I thought might require a holiday miracle! And just then I remembered reading an old newspaper article from the Bnei Brith Messenger from December 1940, about a very special Chanukah celebration which in that year would bring together the people of Hollywood and my neighborhood of Boyle Heights to address fascism. I had a really great time! I’m really grateful to have spent the holiday with some dear friends, and to share the season’s joy with new friends as well. And below you will find a more detailed written history and some fascinating sources on this topic. Chag urim sameach… happy festival of lights! The history of Chanukah Balls and Banquets in the early-20th century. 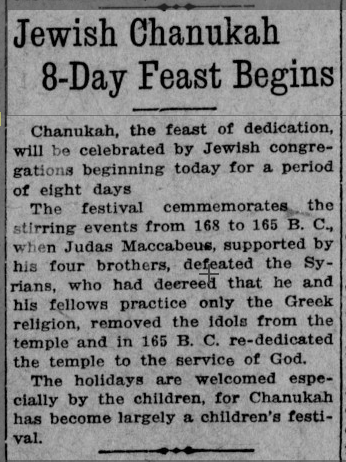 In the first half of the 20th century in Los Angeles, Chanukah was seen as mostly a child’s holiday. The synagogue Hebrew schools would host all day celebrations for the small children. And for the the older youth, the ladies of society would host balls in the grand ballrooms to encourage the mingling of Jewish young people. Then around 1915 these events would become more and more cause-related, and often tendered to in some way be focused on the national matters, matters which were important to Jewish people and the American nation at large. In this spirit they would begin to hold charity events for causes, such as war relief amidst the First World War. And in the zealous national theme of the holiday of Chanukah – and in the spirit of the times in regard to the aspirations of many people for the establishment of a haven for Jews in Palestine – for those so inclined to the almost Maccabean sentiments of the time, the holiday events would also at times begin to take focus around Zionism. Though it must be noted that this would most certainly become a secondary cause for many Jews, in the face of more pressing domestic and international issues. Then taking the lead in organizing Chanukah functions starting in the 1920s was the AZA – Aleph Zadik Aleph – a fraternal group dedicated to patriotism, Judaism, love for one’s familial elders, and charity; today they are a junior auxiliary of BBYO – the Bnei Brith Youth Organization. And that was what celebrations for Chanukah were like in the early 20th century; something between a mixer for Jewish young people and a charity ball. It is out of this mold that would emerge a tradition of Chanukah celebrations being held by junior auxiliaries and charitable societies, in order to rally people around a cause. 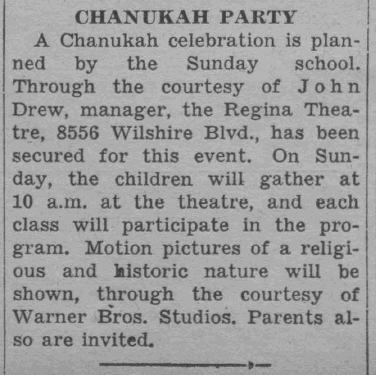 Chanukah parties were sponsored and held in theaters which showed motions pictures of “a religious and historic nature,” shown through the courtesy of Warner. Bros. Studios. In the backdrop of Hollywood, Chanukah in Los Angeles would flourish as a holiday. Now tonight we are going to talk about one Chanukah celebration that would bring the Jewish community of Hollywood out to Boyle Heights in the year of 1940 for a matter that was very important to the Jewish people, the American nation, and all the nations of the world. To address the threat of fascism which was ravaging Europe, and causing discord domestically in American. This Chanukah luncheon would attract some of the finest people of Los Angeles and Hollywood society to the banquet hall of the Jewish Home for the Aged, then located in Boyle Heights. Ida Mayer Cummings (oldest sister of Louis B. Mayer of MGM) and actress Mary Pickford would fund-raise for charities together for over two decades. Photographs provided courtesy of the Alicia Mayer Collection. Among them would be the famous silent film actress Mary Pickford. For over 20 years the Hollywood actress would involve herself in philanthropy and charity fund-raising. It is important to note that among the most notable stories in Boyle Heights history are those of her charity events she co-hosted along with the Junior Auxiliary for the Jewish Home for the Aged. The actress was often the celebrity draw for charity banquets such as these. Though the most important and interesting person behind the success these events would be Ida Mayer Cummings, the older sister of Louis B. Mayer of MGM Studios. She was a notable socialite and charity fund-raiser who was connected to all the important people of business, industry, as well as the religious, civic and philanthropic leadership. And by all accounts, an amazing organizer and larger than-life character who touched many with her gripping appeals. And she knew more than a few things about how to bring a crowd of influential people together as well. This one holiday event for Chanukah in the year of 1940 drew out a record crowd of the big movers and shakers of the city of Los Angeles and Hollywood itself – over 500 guests. This luncheon attracted an amazingly diverse group of studio heads, actors, politicians, a bishop, a rabbi, members of the most wealthy families of the city, as well as thrilled young socialites. They had all eagerly come out that day to hear a most special keynote speaker to address the current crisis threating the Jewish people and the world. Ida Mayer Cummings with Eleanor Wilson McAdoo at the Jewish Home for the Aged in Boyle Heights in December 18th 1940. Picture courtesy of the Alicia Mayer Collection. The greatly anticipated speaker was Eleanor Wilson McAdoo, the youngest daughter of former President Woodrow Wilson. She would address the Nazi threat in Europe and the sad spirit of isolationism which had gripped the American public, and the anti-refugee rhetoric which was prohibiting Jewish refugees from immigrating to America. Keep in mind that it was already two years after Kristallnacht erupted in Germany and the invasion of Austria, and a whole year after the invasion of Poland… yet, it was still a year prior the attack on Pearl Harbor which would eventually draw the United States into the war. All this spoken correctly at a time when the war was going from bad to worse. Little did the people attending this banquet know that on this very day Hitler would order the execution of Operation Barbarossa, the German invasions of Russia. “The first words of the Lord recorded in the Bible are, ‘Let There be Light’. No one can live in darkness. Every year the Jew rededicates himself to the spreading of the light through the world. “We shall continue to do so despite Adolph – we do not mention the rest of his name. Adolphs or no Adolphs, Israel will still go on. What we suffer is only temporary. This was followed with the saying of the national anthem and singing of songs, and many rounds of thunderous applause. “Chanukah luncheon attracts record attendance. Mrs. McAdoo pleads for brotherhood.” Courtesy of the Alicia Mayer Collection. “Mrs. Eleanor Wilson McAdoo Guest speaker at Chanukah Luncheon of Old Home Jr. Auxiliary Wednesday.” Courtesy of the Alicia Mayer Collection. Mrs. McAdoo was presented with a Star of David award. This was an amazing display of resistance to fascism. They were resisting the normalization of the Nazi darkness that had descended upon and was spreading across Europe. They were boldly standing up to the isolationism which had a firm grip on the American public at the time. However, what is largely unknown this side of history is that this assembly was also resisting Nazism and fascism here in the city of Los Angeles as well. 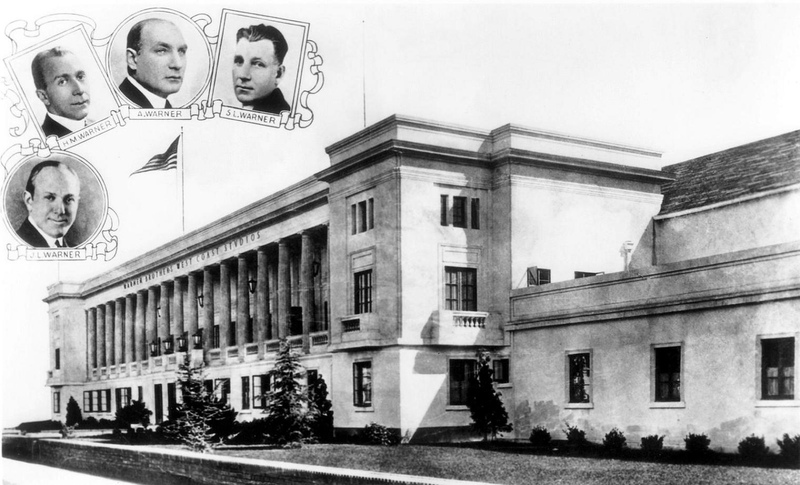 Just a few miles away in downtown Los Angeles, the American manifestation of the Nazi party was actively recruiting and advocating for Nazi Germany at the headquarters of the German American Bund. Despite the strong Jewish presence in Hollywood… or I should say, in spite of the Jews in Hollywood… Nazi-sympathizing and antisemitism had made much inroads into Los Angeles society, and through out the country. In an age in which nationalism was still fashionable and in a time when people attended controversial political meetings was common, national socialism could be founded in the mix. As well as various assortments of fascist sympathizers as well. Indeed, early on Mary Pickford herself – this most famous actress of the silent film era, known simple as “America’s Sweetheart” – early on she was know for being vocally pro-fascist, praising Mussolini when he came to power. Pickford even praised Hitler as late as 1937. Like many people she thought these men were strong leaders who were out to make their nation strong for their own people, and sympathized with their aims and rhetoric. However, in the next few years she appears to have shifted in her views when their genocidal intent became clear and evident. Pickford would feel so repentant that she would even write a whole chapter confessing this in her memoirs titled, “Sunshine and Shadow” printed in 1955. What is important to note is that Mary Pickford would make amends for years to come through charity work starting around 1940, especially focusing on advocating on behalf of the elderly. And so she quickly become very active in helping Ida Mayer Cummings with the Junior Auxiliary for the Jewish Home for the Aged, and would remain actively involved with them for the next two decades. Pickford would actually raise enough money to build an entire new wing for the Jewish home, which was dedicated and named in her honor. It is also important and right to point out that Pickford was as a conservative – she was far from being a Hollywood liberal and radical – yet she unabashedly threw her support behind the Jewish people and the antifascist cause at this Chanukah luncheon in 1940. The turn out of Los Angeles and Hollywood society to the Jewish Home for the Ages in Boyle Heights on this special holiday was certainly impressive… and also really bold. Actually, it was more bold that you might imagine. There is one shocking fact that was kept secret from the public until it was recently revealed by scholars, how from the Nazis headquarter in downtown Los Angeles there where American fascists who were even planning terrorist attacks on the Jewish public. They were plotting to kidnap 20 Jewish Hollywood studio heads and their allies, and execute them in order to kick off an American pogrom. While also planning on going on a terrorist rampage with machine guns, to kill as many people as possible in the densely populated Jewish community of Boyle Heights. This plot and its foiling detailed in a pair of excellent books recently published. “Hitler in Los Angeles: How Jews Foiled Nazi Plots Against Hollywood and America” by Steven J. Ross, and “Hollywood’s Spies: The Undercover Surveillance of Nazis in Los Angeles” by Laura Rosenzweig. These types of threats were being thwarted by Jewish anti-fascists and their supporters in Hollywood, and yet somehow remained a closely guarded secret by these leaders, many of them sitting in that very room. And that is what really strikes me. That what these people were doing was not just politically bold to take this position regarding American’s disgraceful foreign policy of isolationism in the pre-war years… they were actually resisting fascism… fascism which was not just a threat to Jews in Europe, for indeed they were also showing resistance to the normalization of fascism that could be seen on the streets of Los Angeles. It amazes and inspires me that against this backdrop, they boldly choose to come out and face the darkness with light! Special thanks to Alicia Mayer, great-grand-daughter of Ida Mayer Cummings who was the oldest sister of Louis B. Mayer’s family; for opening up the family photo albums and scrapbook archives, and sharing this information to help me make this storytelling possible.